This Crystal Embellished crop jacket was worn by Jermaine Jackson In (1974) and featured on two appearances – The Sonny & Cher Comedy Hour (1974) & Mike Douglas Show (1974) This is an incredible piece of Jackson Family HISTORY! 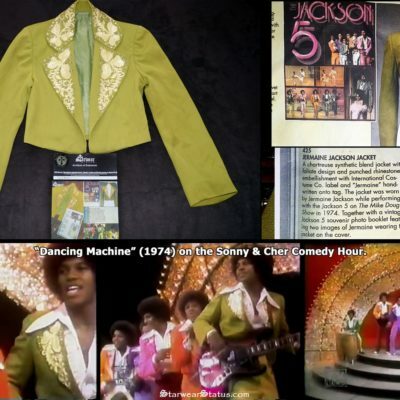 See images with Jermaine wearing the jacket next to Michael Jackson during their Sonny & Cher Comedy Hour appearance. Stage Worn by Jermaine Jackson During the HIT Jackson 5 Tracks: Dancing Machine & Too Late To Change The Time. 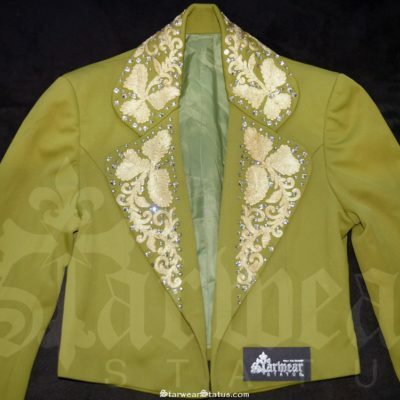 Jacket features: Incredible embroidery on the jackets lapels with crystal studs embellished throughout . Tag Reads: International Costume Co. Hollywood Calif. Where Jermaine’s name is faded but faintly readable. Footage below features Jermaine wearing the jacket, when performing with the Jackson 5 on the Mike Douglas Show (1974) & The Sonny & Cher Comedy Hour (1974).